Hello! Today I am featuring new designer paper from Fusion Fashion Flair. It's a new line of product by Studio 313 and McMahon Five. The Digital Designer Paper that I used in my card is called "Fall Color Collage", and the sentiment is from 'Peony Sentiments'. Originally I planned on making a one layer card. I just wanted the beautiful paper to be the focus. But no matter what I did, it just looked too plain for my taste. I just love layers! So I decided to create different layers, using the same designer paper and just layer them on top of each other. I simply printed the paper twice, then cut out the small panel on the right and mounted in up on dimensionals. I then hand cut the butterfly in the top right corner and mounted that up also. I love the way it turned out! Ribbon and pearls were added for embellishment, and wa-la, my card was done! I thought it was the perfect solution to making a single designer paper more interesting and also to show off the pretty paper! Be sure to check out my fellow designers posts; they are listed in my sidebar. You can see the rest of this week's new releases at the McMahon Five Designs Blog. This is so beautiful Amy that paper look gorgeous I love the sentiment as the main focal point and that ribbon this looks wonderful. 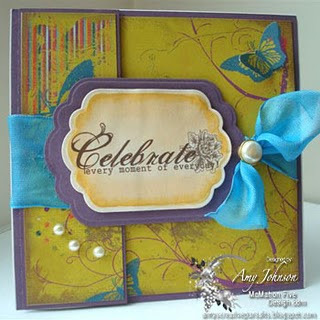 Wow- this is a stunning card- your idea to layer and add the butterfly is brilliant! Simply fabulous Amy - so simple and elegant and yet a stunning card, and the dp certainly takes center stage!